Yes. I said it. 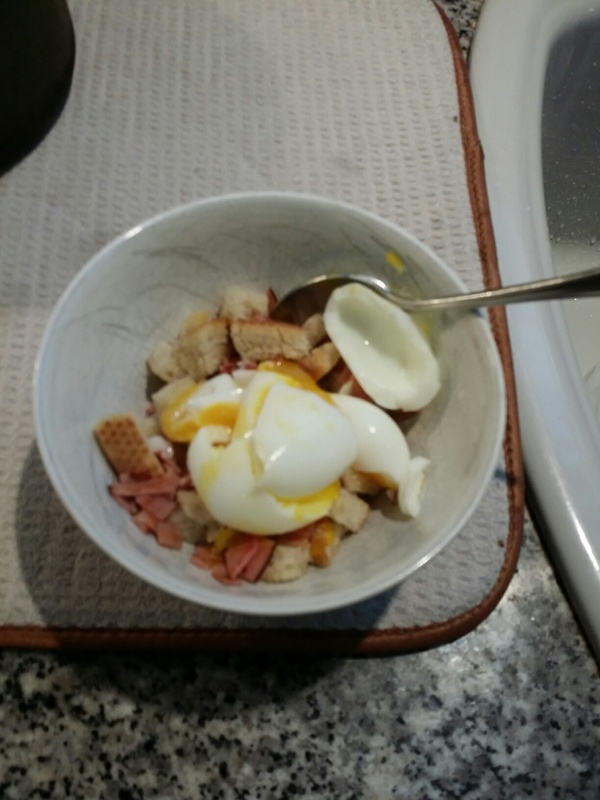 Soft boiled eggs… The food of the riche’? NOT IN MY HOUSE !!! She used to do 3:30 minute eggs… I like 4:00 ones… Who Can’t boil an egg? Drop the eggs… into the water and let them soak… set your timer for 4 minutes… in the mean time, toast the “San Francisco Sliced Sour Dough Bread” in the toaster… Butter it up… Chop it into 1/2 inch cubes, and set aside… then, as a kicker today.. So now you’ve got chopped toast, chopped thinly sliced pan-fried ham, and soft-boiled egg in your bowl… Add a little finish salt, ground black pepper, a touch of dried dill, and either Tabasco or , my recent favorite, Sriracha, then stir and chop… then EAT !!! The taste is amazing… if you want to get more fancy, you could add salsa, or fresh tomato… Feeling Fancy? Add chopped Avocado… Crushed tortilla chips instead of toast? It’s your World….. Simply Apply Heat and Eat !! Memories? It’s the best way for me today to keep in touch with what my Mom gave to me in my early years… Heart, Love and Soul… Love you Gypsy !! Reblogged this on APPLY HEAT & EAT…. Love your memory:). This is so beautiful. I hope my kids look back at their Mom with such love!